Kuantan used to be a place I’d visit at least twice a year because back in his audit days, rif was stationed there for a month or two. When I went over for the weekend, we’d explore the area for good eats. Given our hectic schedules these days, I don’t foresee us revisiting anytime soon. So I decided to do a Top 10 list to remember the good days. I’ve heard a great deal about the (halal) curry laksa at Hoi Yin and the shop gets packed by 10am. It’s best to go early as they run out of curry mee fast. The noodles are available in 3 sizes; Jambo, Besar and Kecil. The curry broth was spicy but also creamy and sweet – one of the tastier curry broths I’ve tried. Each bowl comes with steamed chicken, cockles, bean sprouts and tofu puffs. The accompanying chilli sauce packs quite a punch so go easy on the amount. 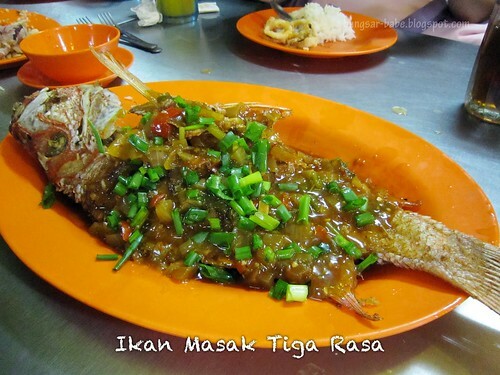 Ana Ikan Bakar is a popular ikan bakar stall in Kuantan and by 8pm, it’s a full house. Basically, you head to the seafood counter to choose the type of fish or seafood you want before informing the staff of your preferred cooking style. I usually go for the masak sambal petai and tiga rasa. The former features grilled fish with sambal sauce, onion slices and fresh petai. I like that the seafood is prepared in a banana leaf wrap, so it gives a smoky-char flavour to the food. Try this for yourself! 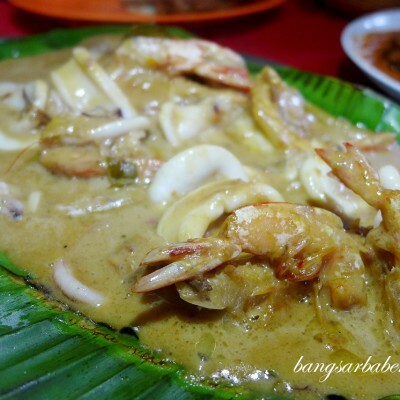 Another restaurant worth checking out is Alor Akar Seafood Restaurant, just off Jalan Beserah and it gets very crowded during weekends and public holidays. The herbal chicken is good stuff and I strongly suggest you call ahead to book your portion. 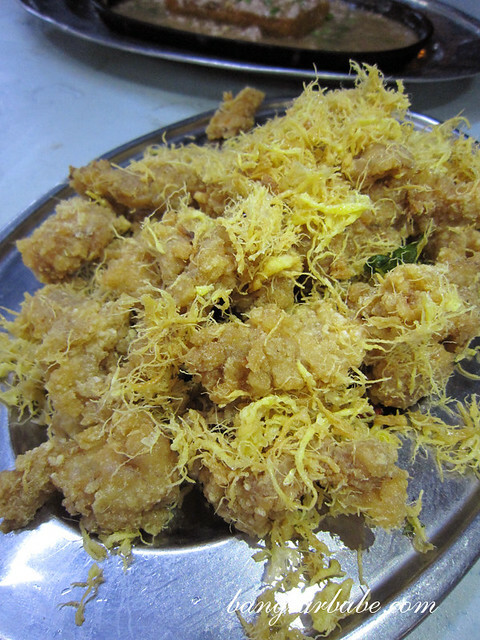 We also like the butter-fried mantis prawns, salted egg yolk squid and homemade tofu with minced pork and salted fish. The cooking style here is very homely and portions are hearty. Best part is, if you dine in a group of 6 and more, the food is very reasonable. 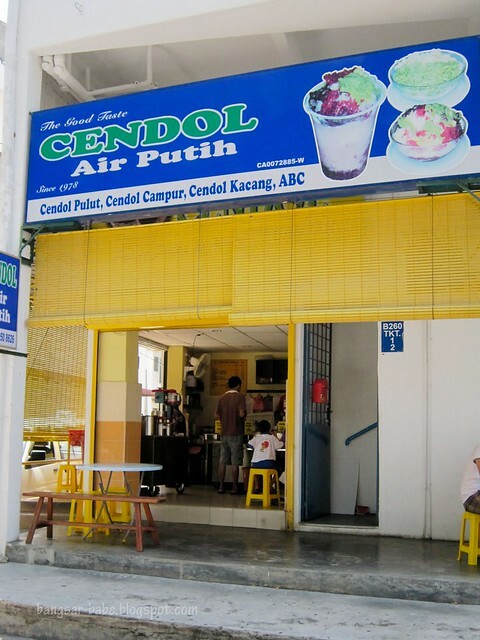 Cendol Air Putih, also known as the Kuantan Cendol is THE cendol place to go to in Kuantan. At least according to the locals. It’s a small shop along the main road so keep an eye out for it. 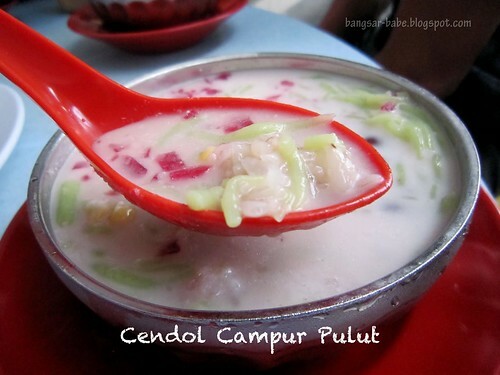 Order the cendol pulut; and if you’re feeling indulgent, go for the cendol campur pulut. 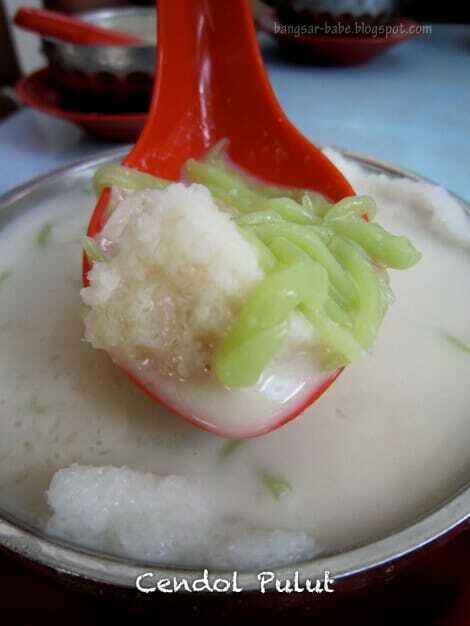 I prefer the former as the mixture of ais kacang ingredients in the cendol campur pulut didn’t do justice to this sweet treat. 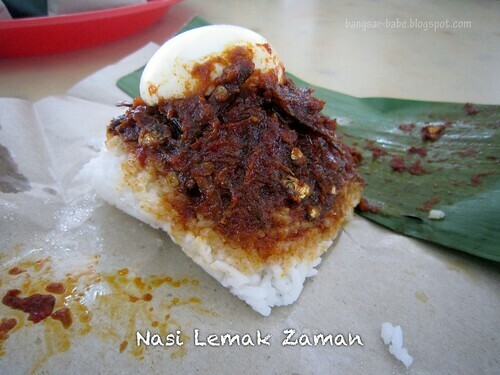 Restoran Zaman is said to serve the best nasi lemak in Kuantan and these little treats sell like hot cakes. If I’m not mistaken, the price is close to RM2 per small packet and I find it quite expensive. But in all fairness, it was delicious. The rice was aromatic and rich from the coconut milk, and the sambal packed a wallop of flavour – spicy and sweet with a lingering aftertaste. According to rif, they serve good mee jawa and mee soto too, so do keep a lookout for them. Jess Cafe is well known for its Hakka yong tau fu, served with soup or curry noodles. My regular order here is the yong tau fu with curry kuay teow while rif likes to have the dry kuay teow. The yong tau fu here is generously stuffed with fish paste and the stuffing has a bit of chives and dried cuttlefish for added flavour. Good stuff! I don’t care much about the dry kuay teow, but the curry version is thick and richly flavoured. Boils down to personal preference. 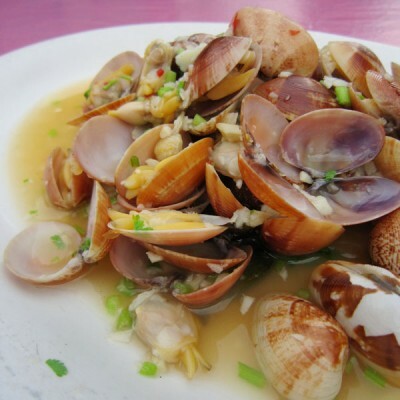 Ah Wah is a simple restaurant recommended for its Chinese and Thai food, done tai chow style. One of the must-order dishes here is the assam fish, served in a metal dish with charcoal underneath to keep the gravy warm. The broth was spicy and sour, and also refillable. All you need to do is ask for more broth and the staff will come over and refill the dish for you. The pandan chicken is decent – fairly moist and tender with sweet chilli sauce for added flavour. After a hike at Panaroma Hill, breakfast at the Sungai Lembing morning market is a must. 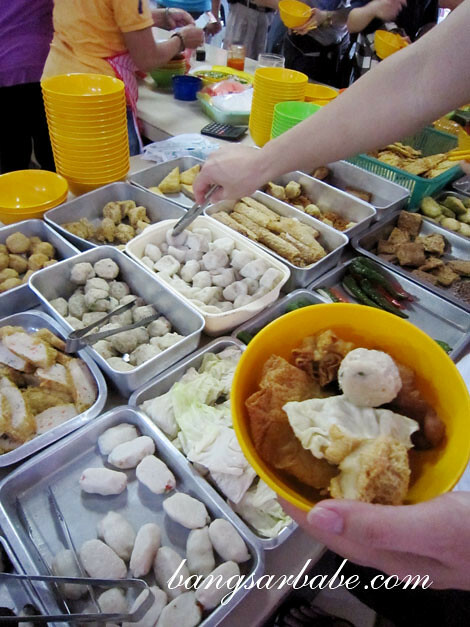 The yong tau fu stall is the busiest of the lot – the locals love yong tau fu here. 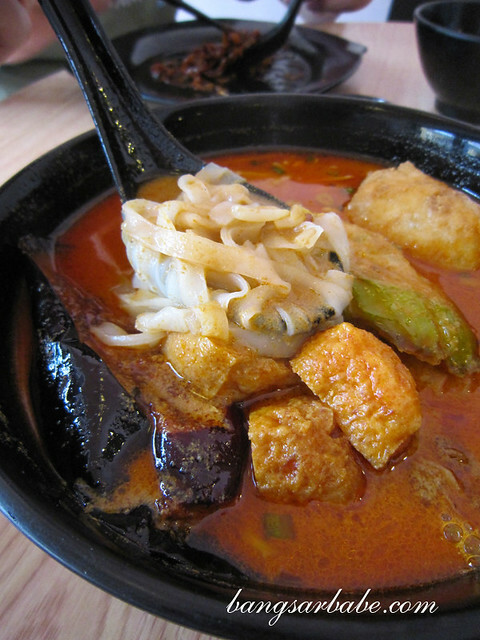 You get to choose the yong tau fu you want and pair it with the noodles of your choice – dry, soup and curry noodles. The noodles are made using mountain water so texture is smoother. To get to the market, just follow the signboard that says Pasar Sungai Lembing. The stall is inside the food court of the market. rif and I stumbled across the curry mee stall at Kedai Kopi Ah Soon by accident. 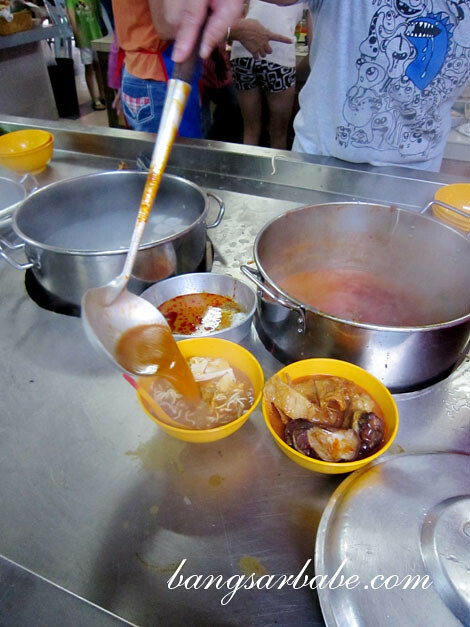 This stall serves something similar to what Jess Café is serving – yong tau fu with curry noodles. While the curry mee was just alright in my opinion, it was the yong tau fu that stole the show. 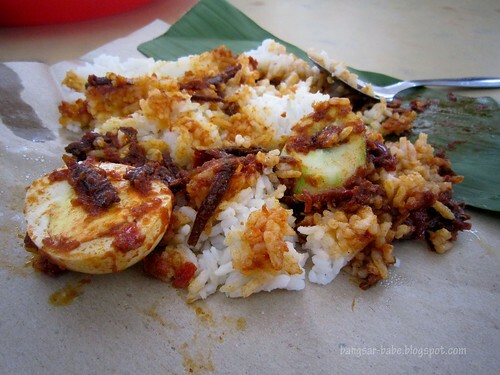 The nasi lemak stall is also popular here but we didn’t get to try this as they were sold out. 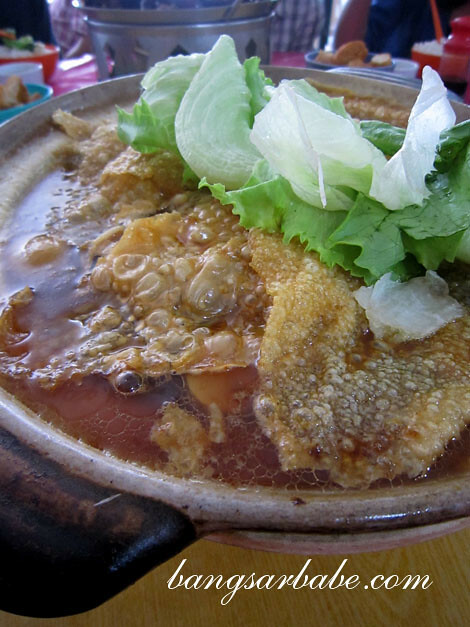 While Yat Hing claims to serve good bak kut teh, it was the sambal fish that rocked my boat. The bak kut teh was just decent – light broth but a strong herbal flavour. I reckon this is how the locals here eat their bak kut teh. The sambal fish was good stuff. More than just spicy, the sambal paste was sweet, savoury, tangy and aromatic from the addition of lime leaves. Sometimes, happiness can be found in something as simple as kaya toast. 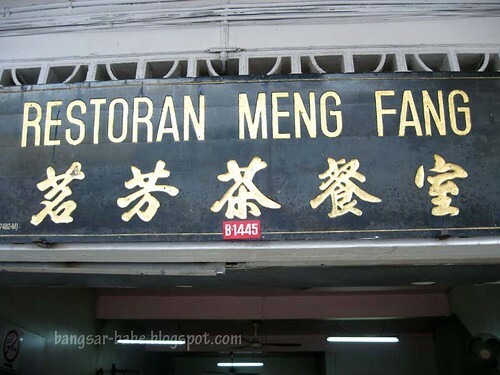 rif and I tried the one at Meng Fan along Jalan Berserah, and it was really quite good. 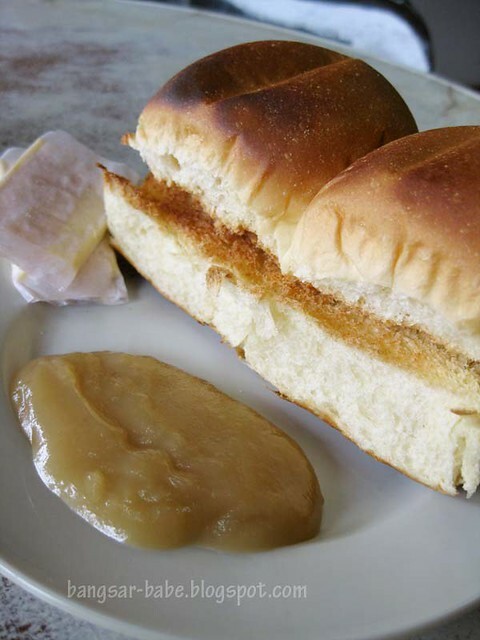 The bun is freshly toasted and served with a thick slice of butter and fragrant kaya (coconut jam). I had this with a cup of old style coffee – bold and smooth till the last drop. 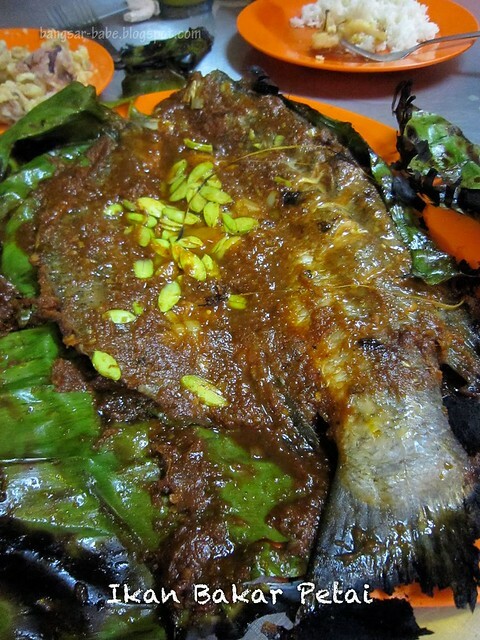 The ikan bakar with petai look sedap! 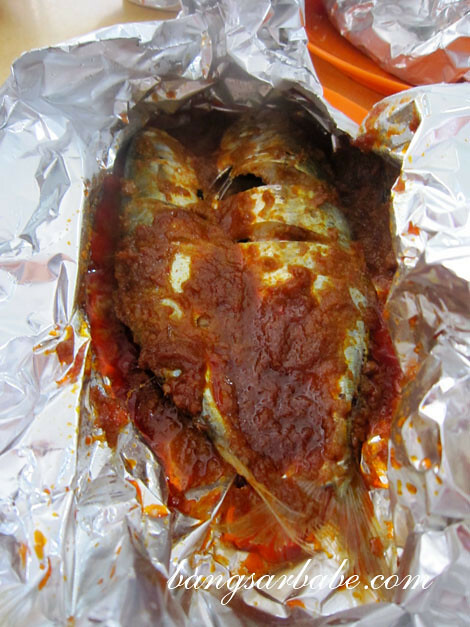 Something different from the usual ikan bakar with just sambal. Muhibbah! Yeah good food. 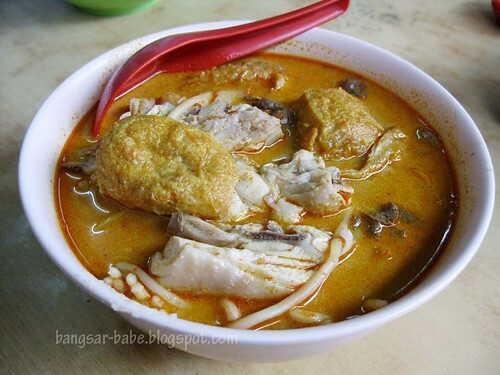 In my opinion, I prefer Restaurant Sri Galing curry mee over Hoi Yin. Sri Galing is very famous for its white tofu. Smooth and delicious. A must try. It is located at Kuantan Garden. You can find awesome nasi minyak and ayam goreng behind Alliance Bank at Jalan Beserah. One of my must visit place when I come back to Kuantan. Now I am craving for it badly. Both my parents are from Sg. Lembing and the love for Yong Taufu is in my blood. 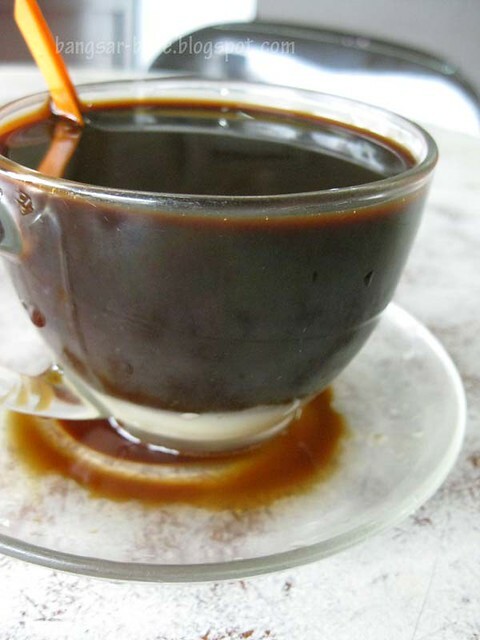 I used to frequent Sri Galing, until the soup became too salty and the Yong taufu became black due to over-frying. Other recommendation is Shim near Fei Ngo Si. There is a Sungai Lembing stall in the food court that sells Lembing Yongtaufu. There are 3 ladies working there and all are from Sg Lembing. I think that would be a better choice. I go there every single time I go back to Kuantan, without fail. I really love Curry Mee. 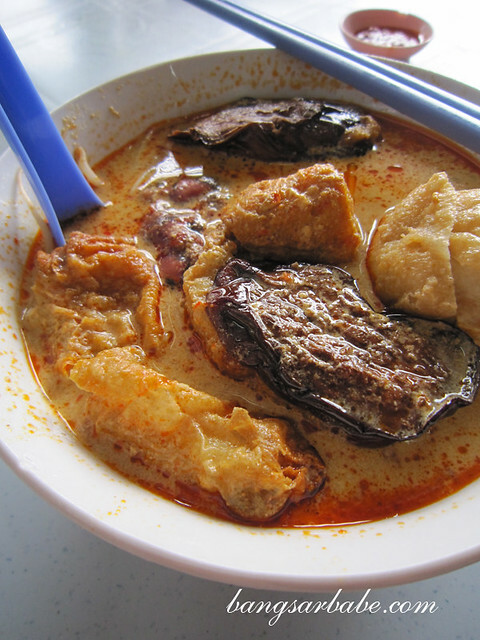 Most of the time, when you ordered curry mee from northern region of Malaysia, you will found that the soup is white in color and it come with a spoon of curry paste. You will need to stir up the paste and the soup so that it create the curry soup. Well, same recipe goes for Ah Hong’s Curry Mee too. You will need to stir up with the soup and noodle before you start to enjoy it. I love them both. Can I recommend another curry noodle house near satay zul (opposite shops) – by the name of teng hwa. Their fish cakes and tofu are pretty good. The soup isn’t as flavorful as Hoi Yin but it does pack a punch if you like spicy. 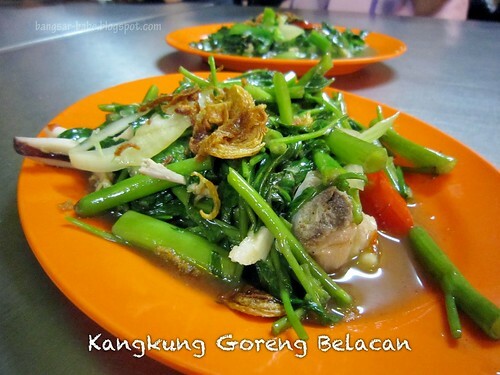 Just want to share some of my favorite Kuantan food. 1.) nasi dagang at Malay food court behind cowboy jalan wang ah jang. Only start selling after midnight. 2.) kong tall mee at Taman tas. Corner shop beside 7/11. I think is restaurant tas jaya. 3.) bak ku tea at 888 food court Medan Selera Jalan Teluk Sisik by a Chinese lady. 4.) cake n pastry by a French baker at star city beside Bulan. 5.) nasi kandar at balok. From Kuantan beserah to Kuantan port on the left before the junction to gebeng. 6.) nasi kukus opposite nissan tan chong. 7.) fook chow restaurant corner shop at jalan penjara. Try their fish belly soup, ice flake beer and steamed la la. 8.) beef noodle soup by a uncle in kam loong hokkien mee food court jalan alor akar. Closed on Monday I think. 9.) also beef noodles by a thai lady food court behind nirwana market air putih. 10.) burger Bakar boss beside mexica restaurant opposite megamall. I hope u can share with all the food lovers. Thank you!!! Hi, coming coconut shake available at Tmn Gelora. U can try it. Don’t forget Nasi Dagang Ubai though it’s not really in Kuantan, it’s quite a long drive towards Pekan. Totally worth it. 1) tomyam kelapa at nik tomyam kelapa at tanjung lumpur. 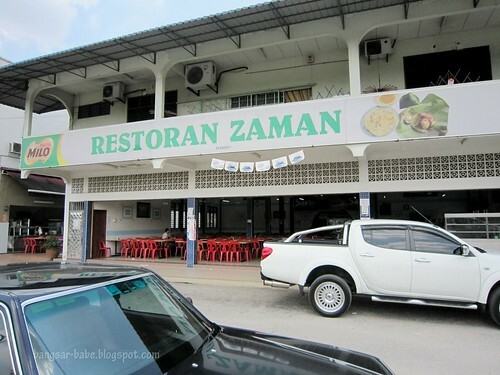 4) casper restaurant area indera mahkota, western there. 5) Kotak kalam mini-bar area teluk sisek. 6) kula cakes, great cakes there. 7) padi restaurant along way to teluk chempedak, porridge best ever there. Another upcoming brand that is rocking Kuantan now. It is Nasi Kukus Mama. Outlets at Indera Mahkota, Bukit Sekilau, (Chinatown) Putra Square and Teluk Chempedak. Best Fried chicken and the sauce is out of the world. Nasi Kukus Mama, exactly just beside Manja Boutique Hotel. Non stop queue up. Im buying and eat at there,from 12 to 3.30 pm. People keep coming. The curry blended nicely with large portion of fried chicken. Sooooo yummy. 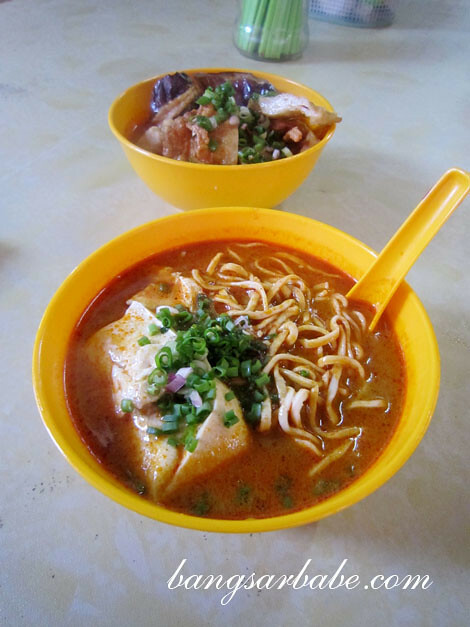 There is a new kopitiam which sells the best dumplings noodles and curry mee in Kuantan. 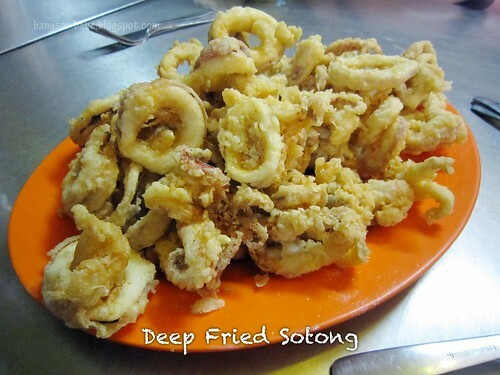 Is called Soon Hing kopitiam and is operate by a traditional Hainan family. The kopitiam is same row with the 911 bistro bar. Which is at the opposite Yat Hing Bak kut teh. Once you try it you will be addicted to their dumplings and curry mee! Their kopi o and teh c taste great too! When we go food hunting our stomach got limit capacity, your recomendation consist too many sub-standard places. Pls rate it, Tq. Good sharing ! Those r my fav’s too !! I would like to share some of my list to you too. 1. 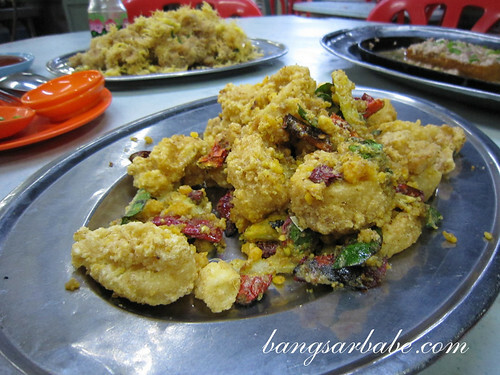 Tepung Goreng (Fried pan mee) – Restaurant Muar E at Jalan Beserah. 2. Cendol & Rojak Ayam – Mustafa Cendol at Jalan Teluk Sisek. 3. Nasi Minyak – Eda Nasi Minyak at Tanjung Api. 4. Nasi Dagang – Pasar Pagi at Kampung Jawa. 6. Beef Noodle & Homemade Yong Tau Fu – Restaurant Kwong Fatt at Jalan Beserah. 7. 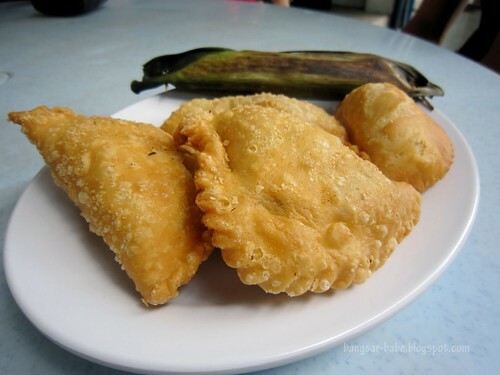 Curry Puff – Stall at Taman Gelora. 8. Satay – Terminal Satay Zul at Jalan Teluk Sisek. There is a new Cafe served original Greek, Mediterranean foods in Starcity Kuantan, very special foods that you can’t get in anywhere. For curry mee , can go for restaurant sri galing opposite yat hing bah kut teh. Jelira nasi kerabu with ayam bakar, in Peramu near Kempadang. Their honey roasted chicken is juicy and tender! Excellent stuff! AH WAH RESTAURANT (THAI FOOD) correct add. Meng Kee Restaurant, Jalan Kelang Lama, opposite Scott Garden. 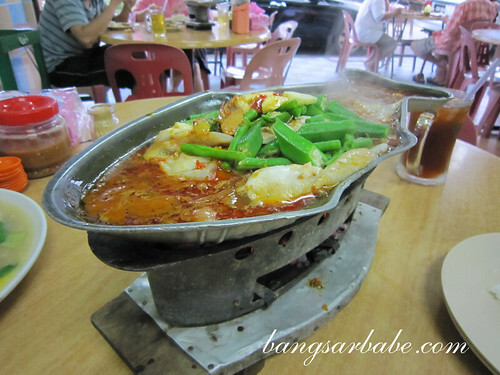 Their House special are Steam Fish and Steam Lala are favourite to most of my friends.